Mayan prophecy and Mayan mythology are inseparable. To understand Mayan prophecy one must also understand Mayan mythology. Mayan Calendar Prophecies (Part 3) explores what happened the last time the Mayan calendar ended as recorded in Mayan mythology. There is substantial evidence among ancient Mayan myths that suggests Earth was hit by several large meteors around the end of the last Mayan calendar 5000 years ago. These impact events created mega-tsunamis that devastated ancient civilizations around the world which led to the appearance of flood myths around the world. 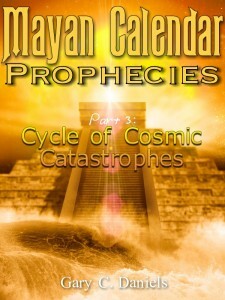 “Mayan Calendar Prophecies (Part 3)” decodes the ancient myths of the Mayan civilization, Greeks, Hindus and Jews to get a clearer picture of the events of 3300 BC, the year the Maya recorded Earth suffered an unimaginable catastrophe. Eerily, the Mayan prophecy for the time period around 2012 referenced back to this 3300 BC event. Did the Mayan culture believe another such event was coming soon and is this why they encoded it in their 5000 year calendar cycle? Modern astronomers have discovered that there appears to be several cycles of impact events associated with the Taurid meteor shower that occurs every year around Halloween. They have determined there are 500-year cycles, 1000-year cycles, and 3000-year cycles associated with this meteor stream. Did the Maya know of a 5000-year cycle which they encoded in their calendar and which was more devastating than any of the currently known cycles? “Mayan Calendar Prophecies (Part 3)” will explore that topic in-depth and help explain what the Mayan prophecies and myths were trying to tell us. Note: All four parts are compiled with additional chapters in a hardcover edition entitled Mayan Calendar Prophecies: Predictions for 2012-2052 which is also available as a paperback and Kindle edition.